Your lamp should adapt to your needs, not the other way around. The E7 LED Desk Lamp is a modern architect task light featuring revolutionary stepless dimming that allows you to adjust your level of light quickly and seamlessly. Push and hold the power button to brighten or dim the light, and stop when you're at the level you need. The lamp's durable aluminum frame includes bendable joints that swivel and bend to provide you directional lighting. The E7 offers diffused, even LED light that's 80% more energy efficient than an incandescent bulb and has a 50,000-hour lifespan. A clamp mount allows the E7 to attach to desks up to 2.25" thick, or add an optional desk or floor base to adapt your lamp (and lighting) to your office decor. Desk base weight 5 lbs. 2 oz. Floor base weight 8 lbs. Max desk thickness for clamp 2.25"
What is a task light? Do I really need one? If you find that your eyes get tired at work or you need to be able to direct your light source, a task lamp can help. Working with the right amount of light is important to keep your eyes healthy and to maintain productivity; the E7 gives you a constant stream of adjustable, non-flickering light so you can work without eye strain. Not all task lights can say the same! How many light settings are on the E7? The E7 LED Desk Lamp with Clamp boasts a fluid dimming feature - this lets you fine-tune your lighting until it's just right. Just touch and hold the power button to dim or increase the light's rays. Release the button when you're at the level of light you want. Easy light adjustments with the press of a button! The E7 LED Desk Lamp with Clamp comes in black, blue, and white color options. You'll get your choice of base in black, white, or silver. 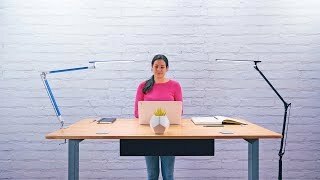 How adjustable is the task lamp's light? The E7 is very adjustable and swivels in both directions from its bases, so you can cast light over your entire work area with ease. The lamp head also rotates, and the light can also be directed to different angles thanks by the lamp's poseable joints. How long do these bulbs last? The E7 LED Task Lamp's intelligent and energy efficient LEDs have a 50,000 hour lifespan. That's more than enough life for years and years of well-lighted work. You won't have to switch out bulbs like you would with an incandescent desk lamp. Desk accessories don't have to be boring, and that is why we offer the E7 LED Desk Lamp with Clamp in black, blue, or white to match your desk frame. Add some light to your desk to ease the strain that comes from staring at a computer screen all day with a new desk lamp. The optional Desk Base can be ordered in silver, black, or white as the E7 LED Desk Lamp with Clamp. Accessorize your desk while adding some functionality with a pop of light and color. Adding the weighted Desk Base is easy. Just remove the lamp from the clamp and insert it into the E7 LED Lamp Desk Base. In no time, you will have an easily repositionable desk lamp to help you see the light. The Floor Base for the E7 LED Desk Lamp comes in silver, black, or white. Add this base to your clamp-on light and no one will be able to tell that your floor lamp once moonlighted as a clamp-on desk lamp. Just remove the clamp, insert the lamp into the Floor Base and you will have a floor lamp on your hands.